Aiming to enter post-season play on a winning roll, Wood River and Community School prep soccer teams put several conference victories in the book over the last six days and, in the case of the Cutthroat boys, a 2-2 tie with reigning State 3A champion Gooding that seemed like a win. On Thursday in what coach Richard Whitelaw called “a pulsating affair,” the Cutthroat boys earned their 2-2 draw with visiting Gooding when sophomore Jay Fitzgerald struck a stunning free kick for his second goal of the game—just two minutes from time at Elkhorn’s Browning Field. 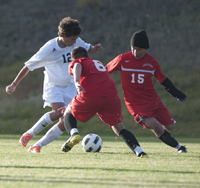 Gooding (8-1-2, 26 points) had beaten the Cutthroats 3-1, in Gooding, back on Sept. 10, and the defending league champion Senators will take the top seed into the upcoming High Desert Soccer Conference tournament. Last year Gooding beat the Cutthroats 7-1 in the HDSC semi-final and Wendell 4-2 in the final en route to its second state title in four years. This time, however, the Cutthroats earned what Whitelaw called a “fully deserved” tie. Sophomore defender Garrett Rawlings earned his coach’s “Man of the Match,” honor. Friday, the host Cutthroats (10-2-2, 7-1-2 league, 20 points) downed Bliss (3-7-0, 9 points) by a 4-2 score with Fitzgerald (18 goals season) notching his third hat trick of the season. Junior Perry Boyle was “Man of the Match,” and soph Henry Everitt tallied his first-ever varsity goal. Coach Kelly Feldman’s Cutthroat girls (11-0-0, 10-0-0 league) remained unbeaten with 11-0 and 4-0 home league wins over Gooding and Bliss last Thursday and Friday. Senior Hannah Dies scored four goals against Gooding and two more against Bliss for a total of 23 goals in 10 games. Other scorers in the Gooding game were Lilly Jenner (2), Josie Allison (2), Samantha Busby 1, Jordan Fitzgerald 1 and “Player of the Game” Hayley Murach 1. Dies added three assists and Katie Feldman one. Besides the two goals of “Player of the Game” Dies against Bliss (6-4-0, 18 points), Katie Feldman and Busby also scored. Fitzgerald had two assists and Feldman one. Goalkeeper Olivia Ott (7 saves) stopped a penalty kick to secure Sun Valley’s seventh straight shutout and ninth overall. On “Senior Night” for what coach Luis Monjaras called a big class of 11 seniors, the Wood River High boys blanked the Minico Spartans 7-0 on Monday at Hailey’s South Valley Sports Complex soccer field. Wood River had seven different goal scorers, five of them seniors. The Wolverines (7-2-4, 5-2-3 league, 18 points) outshot Minico 29-3, amassed an 11-0 edge in corner kicks and put the Spartan goal area under constant attack for 80 minutes. Probably the sweetest goal came from senior Dylan Black. He tapped home a pass from senior Jose Ortiz at 17 minutes after a play that originated on an Andrew Graves pass from midfield that went to another senior, Stephen Pfeiffer, along the right wing. It was Black’s first-ever varsity goal. Senior Miguel Velasco Martinez converted an Andrew Graves corner kick at three minutes. Sophomore Yuri McClure stretched the halftime lead to 3-0 on a Carlos Martinez cross at 39 minutes. Ortiz tallied his sixth goal of the season, sent in alone by senior Zac Miczulski at 49 minutes. Black ripped off another shot that was saved but not controlled by the Minico keeper, and Andrew Graves drilled home the fifth goal of the game and his second of the season at 58 minutes. Junior Jon Scott lined a 16-yard missile at 68 minutes, and senior Chandler Gifford punched a ball home at 77 minutes, from Velasco. The Wood River girls (9-4-1, 8-1-1, 25 points) wrapped up their regular season Monday at Rupert with a 7-0 win over Minico (0-13-0, 0-10-0). Leading 3-0 at half, the Wolverines out-shot the Spartans 45-2 and owned an 11-0 edge in corner kicks. Freshman Jesse Cole (26 goals season) notched her fourth three-goal hat trick of the fall season to go with single goals by Ashley Carnduff (1 assist), Megan Johnston, Sammi Sutton and Tate Morell.